Many of the brands who were touting their high thujone content before absinthe was again legalized in the US coincidentally and quietlybegan removing claims of hallucinations and other wild effects from their promo material. Many of them blatantly changed the thujone information on their websites without an explanation. All of them just so happen to now fall below the legal limit in the US of 10 ppm of thujone. Funny that. The so-called absinthe available in the U.S. contains no thujone, the psychoactive element that gives real absinthe its kick. While it is indeed true that the U.S. has a legal limit of 10 ppm of thujone, this sentence is still very misleading. The term 'real' absinthe should refer to what was being consumed during the height of absinthe's popularity in the Belle Époque. 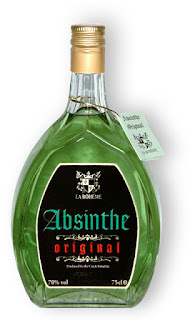 That being the case, Absinthe Original doesn't posess the qualities of 'real' absinthe. 'Real' absinthe of the Belle Époque did not have high levels of thujone, contrary to what antiquated scientific theories hypothesized. The most recent studies have shown that many Belle Epoque absinthes had thujone levels that fell BELOW the legal US limits! Almost all of those that were analyzed fell below the EU legal limit of 35 ppm. Other absinthe manufacturers, (particularly those selling in the US), are so scared at the stigma of thujone that they decide not to use wormwood in their beverages. This is patently false. There is only one brand in the US that has decided to use something other than the traditional wormwood (Artimisia Absinthium): Absente. They began using Southern Wormwood (Artimisia Abrotanum). All other brands (that I'm aware of) that have been produced and/or sold in the US since 2007's legalization utilize authentic Artimisia Absinthium. Yet, without wormwood, many wouldn’t consider liquor a true absinthe. Such reasoning is appropriate, especially considering the fact that real absinthe is derived from wormwood’s scientific name, Artemisia Absinthium. Absolutely true. The Wormwood Society does not recognize Absente as an absinthe. If you're looking for the 'real thing', the spirit that was consumed during the Belle Époque, Absinthe Original isn't it. Feel free to view the Wormwood Society's reviews. And if the product is made from 100% wormwood, then that technically (I'm nitpicking here, I know) would mean that they don't use any other herbs, thereby making this a Wormwood Bitters, NOT an absinthe. Lastly, levels of thujone do not indicate quality of absinthe. There is absolutely no evidence to point to any mention of thujone levels in Belle Époque advertizing of absinthe. It wasn't a factor. It only became popular during the 1990's when brands such as Absinthe Original began to hype it as a way to drive sales to club goers.